Note drop down fields with an option select - if they are subject to hide/show dependency i.e. not visible - do not correctly show the selction on being made visible. They are blank. 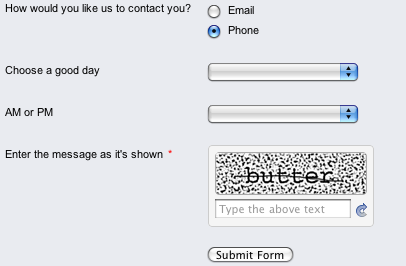 I see a lot of conditions on your Enquiry Form. Can you tell me exactly which one does not work? SHOW Please state type of organisation field. When "Organisation Type" Equals To "Other"
SHOW Choose your sport field. When "Enquiry is for" Equals To "Sportswear"
SHOW Other please state ... field. When "Enquiry is for" Equals To "Other"
SHOW Other sport is ... field. When "Choose your sport" Equals To "Other Sport"
SHOW Print/ Embroidery Detail field. SHOW Choose a good day field. When "How would you like us to contact you?" Equals To "Phone"
SHOW AM or PM field. Just tested those two and they worked fine. Do you still have problem with them? The hide/show dependency works fine. It is the fact that the default selected answer doesn't show correctly. OK, I understand what you mean now. I added this to our bug list. We will get back to you when this is fixed. We have determinated that there was no bug but instead your browser cache simply did not show these. Please shift+refresh your form after making changes on it so that you can change it properly.